Catherine “Cat” Szafran remembers that when her family left Spain, a bonfire at her house burned for four days, for the purpose of consuming her father’s artwork. Years later, when the Barnstones left England, a bonfire burned for a week, again turning Myron Barnstone’s work to ash. It wasn’t that his work wasn’t exceptional. Barnstone had an excellent reputation as an artist in Europe. The truth was that he didn’t want to pack up the paintings for the move or leave the unsettling images he painted behind. Much of his work visualizes the way he saw the Holocaust and nuclear war survivors. “He also did floral pieces that don’t slap you as hard,” Szafran said. Leaving Europe, Barnstone moved his family to Pennsylvania, where he opened the original Barnstone Studios near Allentown. It was a destination for students from around the world who wanted to learn painting and drawing from Barnstone. The self-taught artist had developed a way of teaching art, which is called the Barnstone Method. When Barnstone died in 2016, Szafran set about to honor her father’s legacy and continue teaching the Barnstone Method. She brought out the remaining works her father painted and opened the Barnstone Studio in Thurmont at 202A E. Main Street last September. “This is a nice, little town working toward becoming more artistic,” said Szafran, who lives in Frederick. She also noted that commercial space is much more affordable at the north end of the county, and that the location is a half hour closer to Philadelphia and the Lehigh Valley, where a lot of her customers live. The studio has about five hundred pieces of art from Barnstone. “We are selling his work to fuel the education side,” explained Szafran. Besides selling art, Szafran continues to teach the Barnstone method to students. Master guides teach the method during classes and workshops. They are available live, on DVD, and online. For collectors, the Barnstone Studios offers original works, artists’ sketches, and limited-edition prints. For the more-expensive pieces, Szafran offers a program called Home Is Where the Art Is. It allows collectors to purchase the art in twelve equal, interest-free payments. If you would like to see Barnstone’s work, visit the Artist Angle Gallery at 124 S. Carroll Street in Frederick, which is hosting a Barnstone exhibit beginning February 9, 2019. The show, “A Celebration of Colors: Myron Barnstone’s Palette” will feature some of Barnstone’s brighter art. Learn more about the Barnstone Studios at www.barnstonestudios.com. 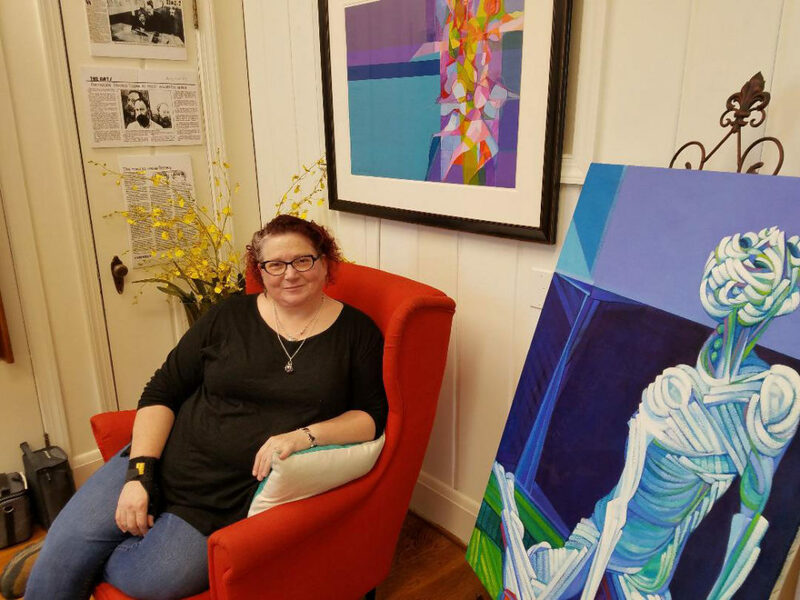 Cat Szafron, owner of Barnstone Studios, sits in front of some of her father’s artwork that is available at the art studio.